In the giveaway, Forty (40) education innovators will be chosen to win a free registration scholarship to attend SXSWedu 2017 in Austin, Texas. Higher education administrators, instructional designers, technologists and full-time faculty are all encouraged to participate. Share your team’s results in innovation and inspire others to make similar leaps at their institutions. Use Twitter or Instagram to demonstrate what your team or institution is doing to create change in students’ learning experiences today. Images are highly encouraged, but how and what you share is up to you! Have you reorganized to support cross-team collaboration? Created new working spaces to support incubator-style programs? Leveraged technology to drive better outcomes? Be sure to include the hashtag #CreateChangeEDU when you share your story. 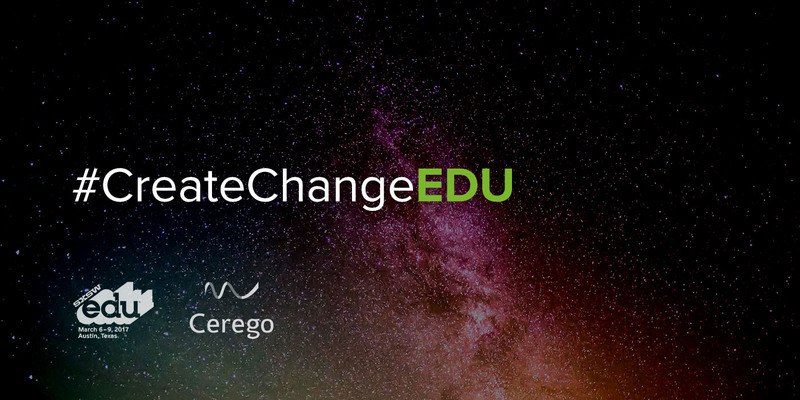 Posts that include #CreateChangeEDU will be automatically entered into to win in the giveaway. Visit SXSWedu to learn more about the promotion and read up on the official rules. Better yet, share your story to get involved in the conversation happening now.